Dexter beef dripping is available online from Deer & Dexter. Normal beef dripping can also be used. The optimal time is when the potatoes are every so slightly soft, without sprouting. This increases the fluffiness inside. This is normally when they are close to their sell-by date. Use big potatoes that can be at least halved, or even better quartered. Peel the potatoes. Swirl them in water to remove starch. Pre-heat a non-fan oven to 200°C (180°C for fan), add roasting tray. Refresh the water, bring to the boil and boil until surface is soft. 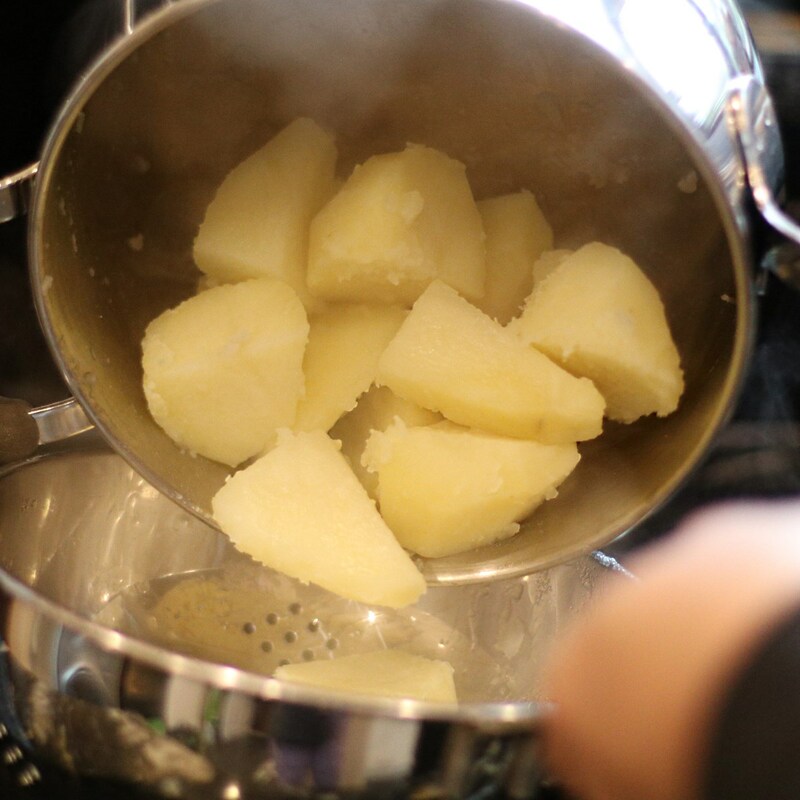 Carefully tip potatoes between pan and sieve 2-3 times to fluff the surface. Add duck fat to roasting tray, then potatoes. Sprinkle beef dripping and salt onto potatoes. Roast in oven for 1h 20min (or until done), refreshing beef dripping at 40 min. So that’s it. There’s may science in there somewhere, however I look at this as a fun journey with the simple goal of trying, and succeeding, to out-spud the mother-in-law. Peel and halve/quarter the potatoes, then place them in cold water. Swirl them around in the water with your hand to remove the starch. Refresh the water in the saucepan. At the same time turn on the non-fan oven and put a roasting tray in the oven at 200°C. 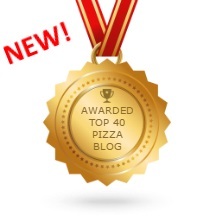 Non-fan ovens tend to produce the best results. If this is not available, use a fan oven at 180°C. 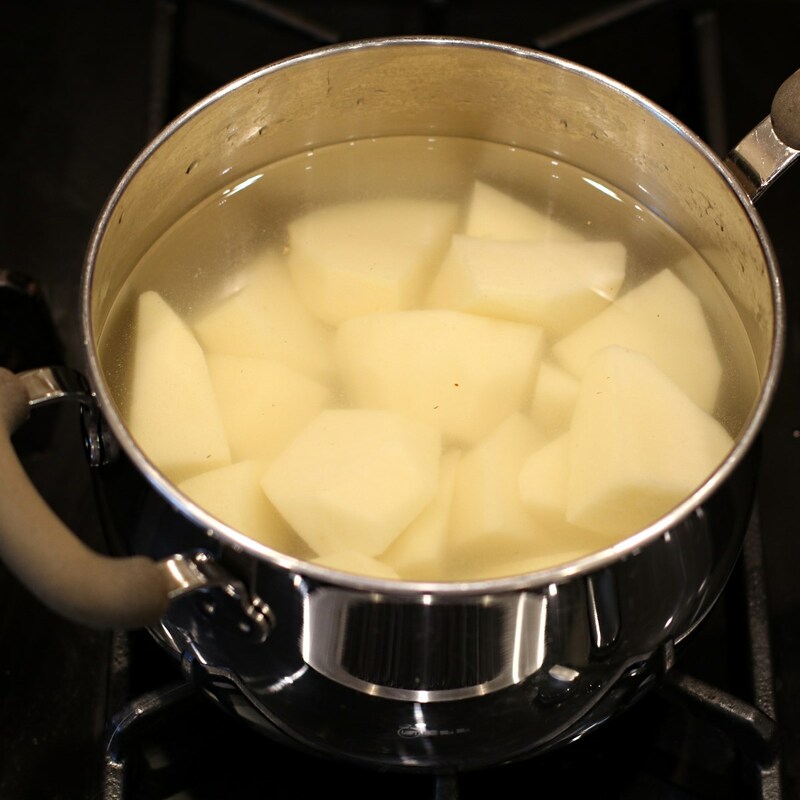 Tip: bring the potatoes to boil in a saucepan of cold water rather than add boiling water from a kettle. 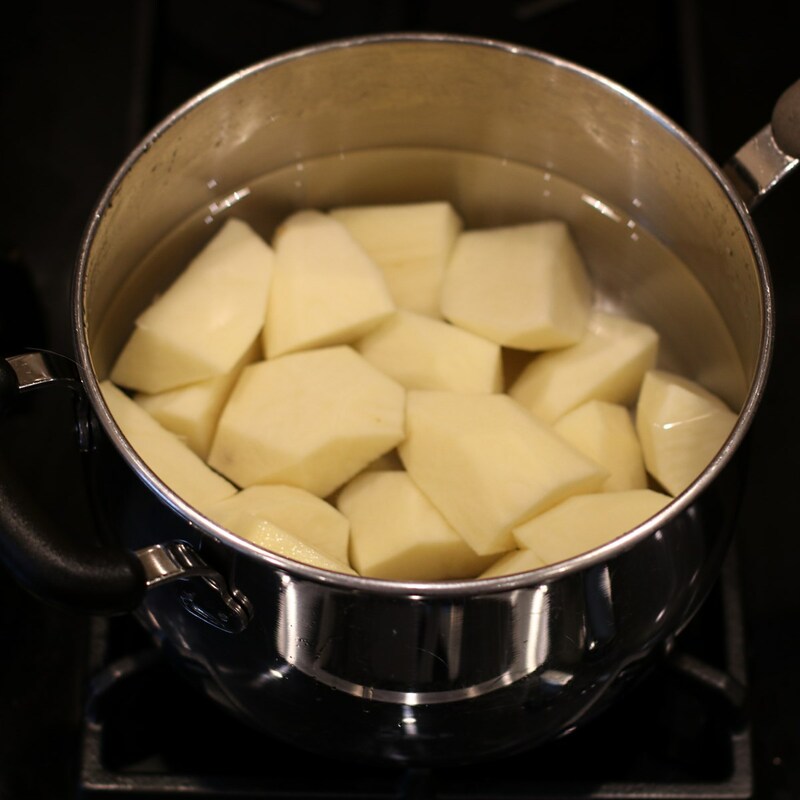 Bring the potatoes to the boil and let them boil until a sharp knife can easily pierce the surface, around 6-7 minutes after the water is boiling. Take the potatoes off the boil. Using a sieve or colander, carefully tip the potatoes into the sieve. Tip back and forth between the sieve and the pan 2-3 times, this will give them a fluffy texture. Tip: use the beef dripping (Dexter or otherwise) straight from the fridge so that it is flakes easily without melting on your fingers. Remove the roasting tray from the oven and add duck fat. Carefully add the potatoes 1-2 at a time, the fat will spit as they are added. Spoon the fat over the potatoes to get them covered. 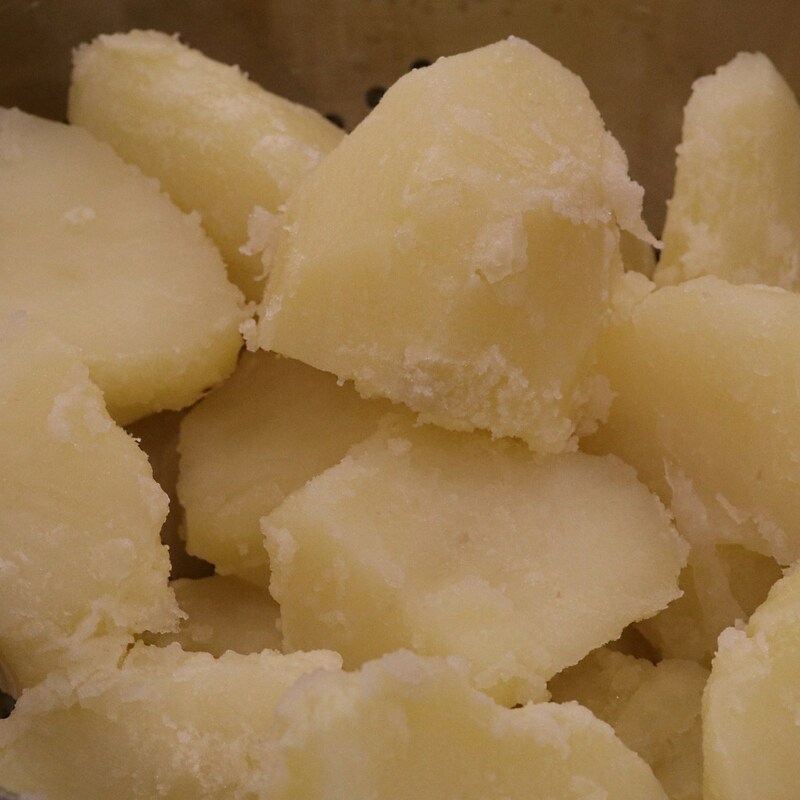 Take some shavings of beef dripping and sprinkle them over the potatoes, along with some salt. Return the tray into the oven and the beef dripping to the fridge. Then is the waiting game and entirely depends on the number of potatoes and appetite of the guests. For our oven and volume it’s normally around 1h 20min. At the halfway mark re-apply the shavings of Dexter beef dripping, again straight from the fridge, as well as drizzling over some more of the fat in the roasting tray. I then flip over the potatoes to get overall coverage.